We're back !! So sorry that there's been no Work Wear Wednesday for the last 2 weeks. My sinus problems ran from Wednesday to Wednesday and I didn't have any in the vault - sorry. 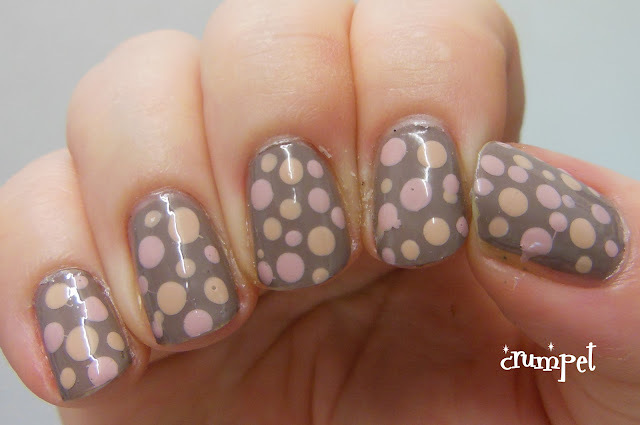 Today we have 2 posts in one - a swatch of the gorgeous Berlin There Done That, and a dotticure I did using the 3 most neutral Germanys. So, BTDT first. Perfection, basically. Taupey autumn goodness, more on the coolish greyish side than I remember You Don't Know Jacques being, and just effortless to apply. This dries glossy and classy - a really elegant polish. Faultless, utterly faultless. For fun, I dotted it up using Don't Pretzel My Buttons and My Very First Knockwurst (apologies for the ravaged cuticles, which I have done my best to hide with the watermark lol). I hoped the 3 polishes together would look like ice cream or a milk shake or something similiar, and there is something very congruent about these colours - I bet they would look awesome in a swirly water marble. The contrasting colours make Pretzel look quite yellow in these photos - it's far more neutral in real life.